This year ECOPA has your Valentine's Day dilemma solved! 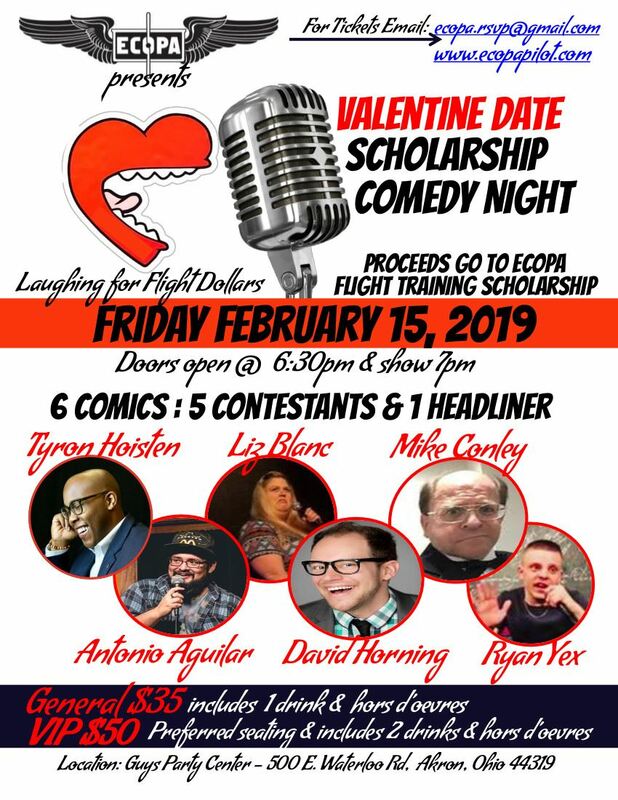 The East Central Ohio Pilots Association is hosting a Valentine's Date Comedy Night to raise funds for our 2019 Flight Scholarship. We will have 6 comedians total - 5 contestants and 1 headliner! Grab you sweetie and join your ECOPA friends Friday, February 15th, at Guy's Party Center on Waterloo Road in Akron for a fun-filled evening of laughs, raffles, and prizes, and more! VIP tickets include preferred seating and two drink tickets, and general admission tickets include standard seating and one drink ticket. Heavy hors d'oeuvres will be served.